When caring for someone with dementia you may have to deal with many different feelings, as the needs of the person with dementia changes over time. You may experience a range of very different and often extreme feelings. This is particularly difficult because as dementia gradually causes the person’s abilities and personality to change the nature of your relationship will also change. There is no simple way to deal with these feelings, but it may help to know that the complex and changeable emotions you feel are completely normal. Remember: you are not alone. Dementia Australia offers support, information, education and counselling. 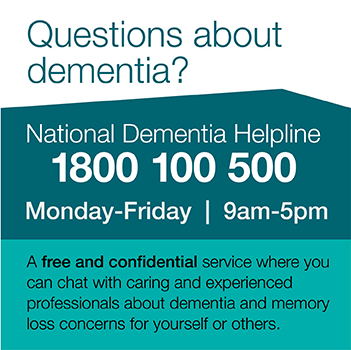 The National Dementia Helpline can be contacted on 1800 100 500. Some of the most common feelings experienced by families and carers are guilt, grief and loss and anger. It is quite common to feel guilty – guilty for the way the person with dementia was treated in the past, guilty at feeling embarrassed by their odd behaviour, guilty for lost tempers or guilty for not wanting the responsibility of caring for a person with dementia. If the person with dementia goes into hospital or residential care you may feel guilty that you have not kept them at home for longer, even though everything that could be done has been done. It is common to feel guilty about past promises such as “I’ll always look after you”, when this cannot be met. Grief is an emotional response to loss. This could be the loss of a relationship, moving home, the loss of good health, divorce or death. If someone close develops dementia, we are faced with the loss of the person we used to know and the loss of a relationship. People caring for partners may experience grief at the loss of the future that they planned to share together. Grief is a very individual feeling and people will feel grief differently at different times. It will not always become easier with the passing of time. It is natural to feel frustrated and angry – angry at having to be a carer, angry with others who do not seem to be helping out, angry at the person with dementia for their difficult behaviours and angry at support services. Sometimes you may even feel like shaking, pushing or hitting the person with dementia. Feelings of distress, frustration, guilt, exhaustion and annoyance are quite normal. However if you feel like this or that you could lose control it is important to discuss your feelings with someone such as your doctor or an Dementia Australia counsellor. Discussions with doctors and counsellors are confidential. Call the National Dementia Helpline on 1800 100 500 or the Commonwealth Carer Resource Centre on 1800 242 636 for further information about counselling. Feel the pain - Allow yourself to really feel what you are feeling, no matter what that is. Denying the feelings only intensifies and prolongs the pain. Cry - Tears can be therapeutic. Let them cleanse and relieve the pain inside. Talk - Share the pain. It is important to talk about your feelings even at the most difficult times. Sharing grief will help diminish it. It can be helpful to talk to a person outside the family, such as a counsellor. Keep a journal. - A journal is a private place where anything can be written including unfulfilled wishes, guilt, angers and any other thoughts and feelings. Let go - Don’t be engulfed by bitterness. Resentment is a heavy load and can only continue the hurt. If there is a source of anger, try to resolve it. Find comfort - Different people have different ways of finding comfort. For many there is comfort in rituals, whether prayer, meditation or other activities. Hold off - Tread carefully before making decisions. Thoroughly explore all options before making major steps. You can be vulnerable at times. Be kind to yourself - Be patient with your feelings. Finding a balance between the happy and sad person, the angry and peaceful and the guilty and glad self. Have patience with yourself. Learn to laugh again - Rediscover your sense of humour. Finding joy in life can be one way of honouring the happy times that used to be shared. Try to make sure that you get adequate breaks from caring so that you do not get worn down. Ask relatives and friends for help. Contact support services to see how you can get regular breaks. Call the National Dementia Helpline on 1800 100 500 or the Commonwealth Carer Resource Centre on 1800 242 636 for further information about breaks. Dementia Australia can link people to a large number of support groups throughout Australia. Many people find comfort and practical assistance by attending these meetings with others who know what it is like to care for a person with dementia. Support groups bring together families, carers and friends of people with dementia under the guidance of a group facilitator. The facilitator is usually a health professional or someone with first-hand experience of caring for a person with dementia. Call the National Dementia Helpline on 1800 100 500 for information about support groups. Dementia Australia is the national peak body for people living with dementia, their families and carers and provides leadership in policy and services. To find out more, contact us or call the National Dementia Helpline on 1800 100 500.